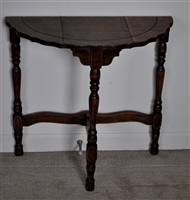 Vintage wooden half moon table, side stand. White Clad Ice box or side table wooden, oak, finish with name plate. MERSMAN Danish style end table in Walnut inlay finish. Portable wooden bar/serving cart on wheels. Wooden game table with Backgammon and Chess board.